I finally completed updating our 5 days Shantou trip on our Travel blog! YEAH! Took me nearly 1 month to complete and all the hard work and late nights on sorting out all the thousand over photos! Phew! ROM session start at around 8plus and I thought we probably can't stay long enough since we got to rush back to pick the kids. On the contrary, the service is extremely efficient with the waitress serving the dishes quickly. The quality and taste of the food is pretty good. Instead of the usual Shark fin soup, there is Buddha jump over the wall and you can see a full abalone in it. Inside the deep fried yam paste ball there is a scallop inside with a basket of scallop, vegetables on top of it. I'm not a fan of eating duck meat but the "pi pa" duck's skin is crispy and sweet. Red Grouper on the other hand is average and didn't give me too much surprise. June holidays are finally over and today the children went back to school for the new school term. There goes the privilege of waking up later than usual... and I got to check the kiddos homework every evening. Denver forgotten that he needs to pack his story books in his bag and didn't even remember what time he finishes class! Earlier, we also forgotten to pack his monitor badge in his bag when he put his uniform to wash. hehehe.. I guess the holiday was way too relaxing and we seems to be a bit disorientated. :p It will gets better in the next few days. Denver is 7 years old and another good news is it still falls within the school holiday! :) He has been counting down and looking forward to have a good time today. Since it's his special day, we travel all the way from Sengkang to Jurong East Swimming Complex. Why? Because Denver loves to have fun in the water and there are Water slides, Lazy River, Waver Pool and many more available at the JE Swimming Complex! After dinner, it's ICE-CREAM time! Swensons is just opposite and we popped in for Round 2. Here comes Denver's Birthday 'cake'. ^_^ Instead of 7 candles, he has 1. :) We all sang a HAPPY BIRTHDAY song and see how happy he looked. Wishing you a VERY HAPPY BIRTHDAY, my dear son. We Love You! A real friend is hard to find. A good friend that you know for more than 10 years is even harder... I'm lucky to still have friends that I have known them for almost 20 years. From secondary school till now.. each of us has taken a different path in our life and we are still able to keep in touch after so many years. While being so pre-occupied with our daily activities, it's so heartening to know how each other is doing. There are many updates and the main highlights is that Rina and Iris are pregnant! Coincidentally, their EDD are end of this year! ^_^ So exciting! Looking forward to the next time we meet again which most probably will be when their babies are born! 今早我去上班了。我不去也好.. 孩子不会对我撒娇和闹别扭。 老公负责带富生去学校看牙医，不到１５分钟，就好了！富生一到家便打电话给我说：“妈妈，真的一点都不痛！我把牙齿带回家了。”　：） 我在想，该把它放在哪。。还是丢了算了? I think Denver finds it interesting to see that the money is being passed to the lady at the counter and eventually stamp on his bank account book. After having some fun and food at the Sakae carnival and got drenched in the rain, we took the train down to Bishan for a movie treat - The Karate Kid. It's a 140 minutes show starring Jaden Smith and Jackie Chan. The movie was about Dre Parker (Jaden) who moves to China with his mother and got involved in a series of fights with the neighbourhood bully. He was saved by Mr Han (Jackie) who is a maintenance man at Dre's building during a brutal beating by the bully and his friends. In the attempt to make peace, Dre was forced to enter a tournament and the story went on with Mr Han training Dre Kung Fu in preparation for the competition. I like the training session scenes and the interaction between Jaden and Jackie which has a mixture of humour and sense. Although I do find some of the fighting scenes a bit harsh and brutal, it was overall a very entertaining film. Denver felt the excitement, had a good laugh and also couldn't bear to watch the kissing scene. ^_^ We had a good time and today was well planned and spent. 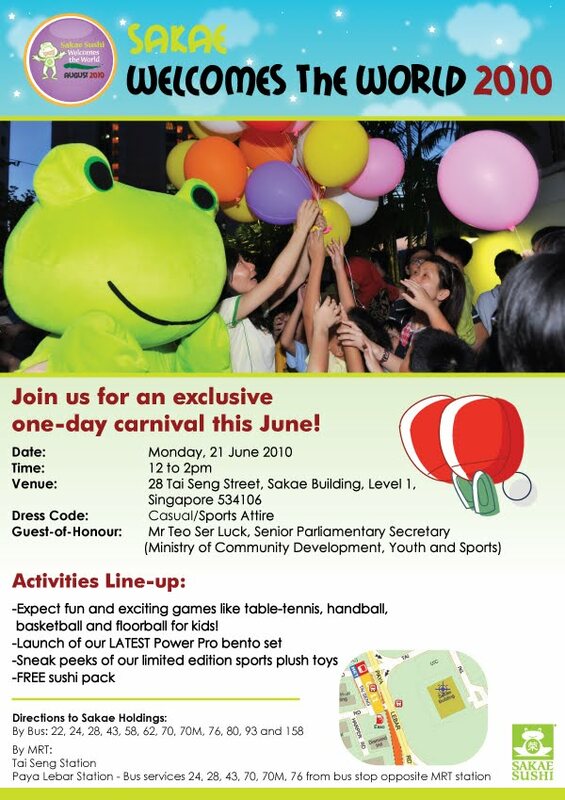 I received an E-invite from Jacintha from Sakae last Thursday to attend an exclusive carnival - SAKAE WELCOMES The WORLD 2010 at the Sakae Building. Specially took a day's off to take Denver out for some fun before the school re-opens next week. Denver and I took the Circle Line down to Tai Seng and Sakae Building is just right across the road after we exit. I happily thought and assume that it's not too far after all... but I was TOTALLY WRONG! After crossing the traffic, we need to make a BIG detour in order to get to the entrance. Anyway, we finally made it there and got to meet Jacintha in person! She is a pretty and sweet lady whom gave us a warm welcome as we arrived. There are already children playing at the various game stations and Denver joins in the fun too. Children can collect a game report card at the counter and there will be a mini free gift upon completing 4 stations and collecting 4 stamps successfully. Denver going through all the 4 stations.... Top Skipper, King of Hoops, Top Challenger Floorball and the Incredible Rush. Denver did well and scored in netball, handball and soccer... :D So he got a few freebies! hahaha. The other highlights for today's carnival is the launch of Sakae's latest Power Pro Bento Set. This is to promote healthy eating and active lifestyle. Mr Teo Ser Luck, Senior Parliamentary Secretary, Ministry of Community Development, Youth and Sports is today's Guest-of-Honour. Sakae also donated $25,000 to the YOG Sailors and Sakae fans can look forward to the limited edition sporty plush toys for archery, boxing, sailing and weightlifting this August. We also received a free Sushi Pack each and that was our lunch. :) MMMMMmmm.. YUMMY YUMMY SUSHI! We are back at Sakae Sushi again! Seems like we have been dining at Sakae every alternate month or so. :p This time we are utilizing the $50 voucher which I won in the Sakae Monthly Bloggers Affair in March to treat Hubby in celebration for Father's Day. 2) For every $30 spent at Changi Airport in a single receipt, you can redeem two tokens to ride the 12 metre slide located at Terminal 3! Here we are!! There is already a queue forming and luckily it is not too long. There is so much space around and the children can't help finding themselves running around. HAPPY FATHER'S DAY! Big Hugz from the kiddos. After accumulating so many dining experience at Sakae, Gladys is now an expert and knows what she wanted. She already set her target on the Tomago sushi and once the plates are within her reach, SWOP.. its on the table right in front of her. Hahaha.. the excitement that comes from grabbing your food. I realized for the outlet at T2, they have a piece of damp cloth placed under the hot water dispenser. This is great as many times, the hot water tends to drip or over flow from the cup. In this way, the damp cloth will soak up the hot water keeping it safe, clean and neat. But it seems to me this is not available at the other outlets which we went. Maybe they can consider doing so for every Sakae outlets. Nowadays I rarely watch TV programs on the local channels and probably has been missing out a lot on what's the latest advertisements. I happen to come across this particular video online (The latest installment of National Family Council's Family campaign) and was so touched! This advertisement brings out a strong message "How one generation loves, the next generation learns." How true indeed..... from the eyes of the young boy, he sees and feel that his grandmother has been a difficult person... but the father has always show patience, respect and honour his mother who took care and love him so much when he was a child. Isn't this something that we should reflect and learn from. Tomorrow is Father's Day.. Here's wishing all fathers! HAPPY FATHER'S DAY! After dinner, we walked around and dropped by a dessert shop - 谢记 Hongkong Dessert (around Jubilee @ Ang Mo Kio) to try out some of the desserts. After browsing through the menu, I was amazed to see "双皮奶" in the list! It has been ages since I tasted that dessert for the first time when I first travelled to Hong Kong with Hubby. 双皮奶 can be served as a hot or cold dessert and it was really delicious. Each of us ordered a different dessert to try. I was very disappointed with the 双皮奶 as it didn't has that extra thin layer of 奶皮 on the top (like the one I had in HK). That was what made the dessert special. The taste is also not as fragrant and milky... it seems like a normal cold milk pudding to me in this case. The double-steamed pear on the other hand is warm, sweet and refreshing. You can also eat the entire pear after drinking the soup. As for the Mango Pomelo, it is a fresh, fruity thick mango taste. Snow Land is another milk drink suitable for the kids which is rich in calcium and helps to strengthen the bones. The overall presentation was good. Unfortunately, I feel it is a little pricy with the small servings and the lack of unqiue flavour. Next week is Father's Day. We usually dine together a week ahead to avoid the crowd. Hubby suggested to go to Chu Yi Kitchen located in Ang Mo Kio. The reviews online was pretty good so we decided to come here and try. It is a pretty small cze char eatery place under the HDB block with a couple of tables. Looks like a coffeeshop style and yet provides catering and delivery service as well. Unlike the usual kopitiam where we'll be expecting many people dining, here is much quieter. We are also the only big group of diners filling up the table. Nevertheless, we ordered the signature and recommended dishes like Big Prawn Hor fun, Curry fish head, Scholar tofu, Mixed meat platter, Yam Basket, Broccoli with scallop and Prawn paste fried chicken. I particulary like the horfun, tofu and yam basket. For the Big prawn Hor fun, the prawns are big and serves on with a thick gravy. The vegetables are fresh and the hor fun taste nice too... unlike the usual that I normally eat. The ingredients in the Yam Basket is very fresh with bigger prawns, scallops etc and and the taste of the Yam is sweet and good. Scholar tofu surprised me with the prawn and cuttlefish paste within when I bite it. Denver received his National Survival Swimming Bronze Award certificate today. (After passing his swimming test 3 months ago). It also comes with a badge and pin. ^_^ Definitely another acheivement from our boy.